The Amtech Shipping Manager provides the tools necessary to maintain an accurate real-time finished goods and work-in-process inventory. The system tracks the movement of individual units through the entire shipping process and categorizes inventory as to availability. It also supplies shipping personnel with access to accurate production reporting information reflecting all stages of the production lifecycle. Shipping personnel, as well as users outside the shipping office, can easily search the database by specified criteria and use the system to view detailed production and shipping information including: when the order was produced, loaded, shipped and what trailer it was on. It is also possible to view unit level production for a given order along with all release, estimate, work center and user message information. Provides real-time production reporting reflecting all stages of the production lifecycle. Accurately tracks all shipping trailers and allows for manual or automatic scheduling of trailers. Allows detailed plans reflecting the optimized requirements for delivering goods on-time at the least expense. Displays “pick lists” with up to date shipping and production information directly to the loaders. Allows users to view individual, unit level production for any given order along with release, specification, work center and messaging information. Provides detailed production and shipping information including when the order was produced, loaded, shipped and what trailer it was on. Provides the tools necessary for controlling inventory down to the unit level. Produces Real-time inventory reports and provides quick accurate cycle counts. Provides historic analytic reports which are used to improve future performance. The Order Manager® operates in conjunction with an installed Avista Database Server and Load Tag Station running Tag Manager® software. A bar coded tag is produced by the Tag ManagerTM so the unit can be tracked by the system. Any shipping station is able to access information on that tag. All operations automatically update the current inventory, assuring an accurate inventory is available at all times. 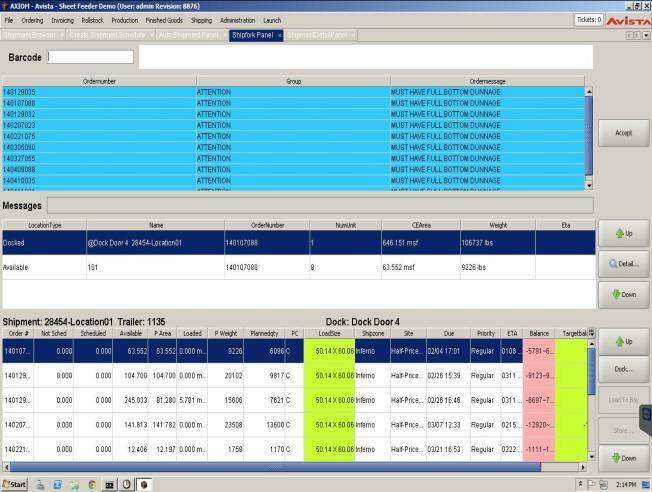 The Order Manager® can be used for shipment scheduling and trailer management. Shipping personnel can accurately track all shipping trailers as well as manually or automatically schedule trailers. The system provides for better trailer balancing by allowing the user to schedule and manage trailer shipments for multiple days. There are also provisions for split shipments allowing the user to identify what needs to be “staged” and what needs to be stored in inventory.The system also supplies decision making information for both shipping and production personnel. By having up to date shipping and production information, users can print highly accurate “pick lists” to speed up the loading process. Not only can operators view this information, they can also view detailed information for trailers that are docked, waiting, and full, as well as future shipment schedules. Using the system, shipping personnel have the ability to search the finished goods inventory and track the location of units within a defined finished goods area. 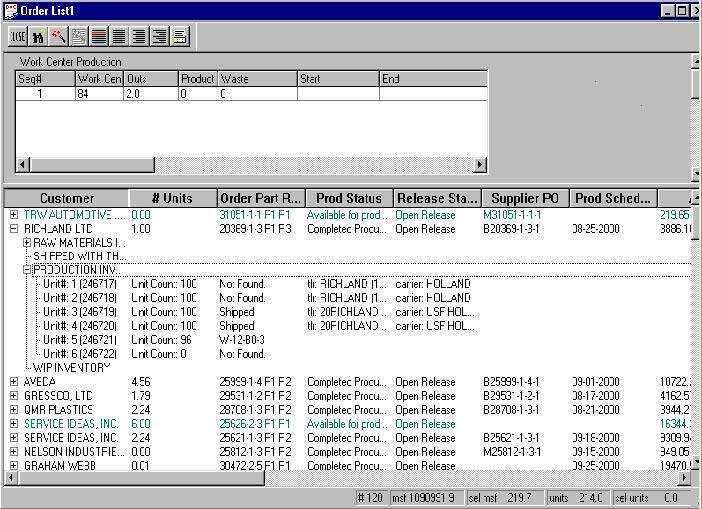 It is also possible to track work in process of unused kit components, as well as monitor overall production and loading statuses of individual orders and units all from within the shipping office! The system provides reports in either hard copy or on-line formats. It is also possible to track and report all activities of the individual users in the shipping process. The Order Manager® Application provides the tracking and control necessary to meet the demands of today’s customer service orientated box plants. In addition to the Order Manager® module described above, additional hardware and software can be added to extend the functionality of the base system. A wireless network may be added to allow for mobile computers to interact with the system for loading units on trailers. This not only speeds up the loading process but also notifies users when wrong units are loaded to a given trailer.For those plants that have the need for tracking receipt of outside materials, the “Receiving Module” is available to control incoming shipments of such items like foam inserts and other “non-corrugated” items. Maintain an accurate real-time finished goods & WIP inventory.